Carlsen and Caruana start their World Chess Championship 2018 adventure today at 15:00 local time. 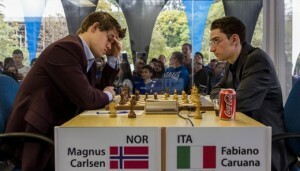 As it has been tradition for 12 years already, the World Chess Championship match Carlsen – Caruana will be live on Chessdom.com with the best analysis in the world. To power the insights of the game Chessdom brings onboard a 128 cores Super Computer equipped with the current TCEC champion Stockfish and a neural network based on Alpha Zero- Lc0 – on Google Tesla V100 infrastructure. You read correctly, this is the strongest EVER analysis provided for a chess game. Is this analysis only going to be available for Carlsen – Caruana match? Caruana – Carlsen game 1 starts at 15:00 local time. As soon as move 1 is made, the evals on this page will be updated.